Now, at first glance this appears to be a relatively unremarkable piece of wood. There are a few letters in it: GS, IR, and 1841. Who cares? Well, as it turns out, I do. Maybe you should too. The story the newspaper article tells is that this hunk of wood was found near the Continental Divide (the point in the Rockies where the rivers start to separate and flow either to the Pacific or Atlantic). It was retrieved by Lade Brewster, of the Brewster family of Banff, who are well known in the region as outfitters, in 1904, and was passed down in the family until it was finally donated to the museum in which it now stands. 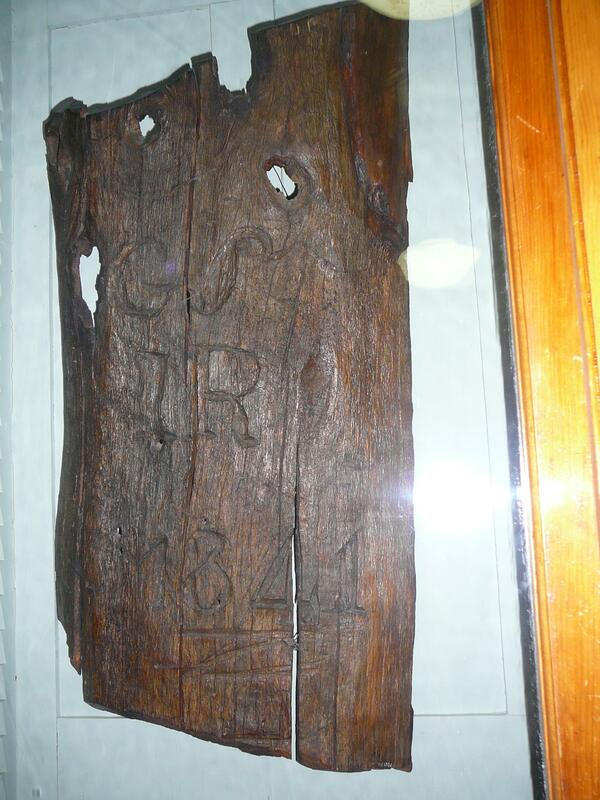 Now, it is entirely possible that this piece of wood isn’t authentic. It wasn’t rediscovered until several generations after it was allegedly carved by these two historical figures in 1841. However, the timeline fits; this would have been around the time Rowand and Simpson were heading West to visit Hawaii (yes, the HBC had a post there). They were quite good friends, though they disagreed on some policy, particularly with regards to First Nations women. Rowand was loyal to his wife Louise D’Umpreville, a mixed blood woman, for over thirty years, and had many children with her, but I really could write a whole post just listing all of the nasty things Simpson called native ladies (including “bits of brown” and “circulating pieces of copper”). Regardless, carving their initials into this log on the date specified is an entirely plausible thing for them to have done to mark their friendship and travels, particularly near such an important site. They were marking that they were there; in the days before snapshot photography, carving one’s initials was a good way of going about doing so. To be fair, I really, really want it to be what the museum says it is. It makes me happy to have come so close to such an object which had been seen, touched, and altered by historical figures I have only read about. This is the kind of encounter that an online exhibition cannot replicate: the physical experience of being in the presence of something that was once touched by someone you admire in history. It’s almost a religious experience: visiting the tombs of famous men and woman, gazing upon the handwriting in the manuscript of a famous document, seeing the texture of the paint and the imprint of a paintbrush in a famous work of art… digital copies cannot replicate that experience. With certain historical documents and artifacts – such as, for example, the Declaration of Independence on display in Washington, D.C., – you literally get the awed feeling of being in a temple, which is accentuated by the architecture but originates in the attitudes of the people visiting the site. Now, for me, surrounded by taxidermied animals (facing this case is a giant stuffed beaver, staring out at you with glass eyes), it wasn’t quite so hushed and awe-inspiring. But I did feel giddy for over ten minutes afterwards. Where to find this exciting piece of wood: Banff Park Museum National Historic Site of Canada, on Banff Avenue, near the river, in the Banff townsite in Banff National Park. (Banff is a running theme, here.) It is a lovely wooden building from 1903, full of taxidermied animals behind antique glass cases. On the second floor, there is a curio case, full of items donated by citizens of Banff over the years. In this case is this piece of wood with a newspaper article accompanying it, which contains the alleged story. Here, have a few other shots of the museum for the road. Note: the glass is over a century old as well! It’s like they’ve temporarily come alive and escaped their “cages”/cases. It wouldn’t be complete without a bison (or two). This raven was still in quite good condition, for all that it died over a century ago. Probably. Maybe it blinked. You cannot escape the taxidermied animals even in the lovely reading room. On the second floor. The place was designed before electric lighting became commonplace, and so the windows and floors were placed to maximize natural lighting. A small room made up to look like the old curator’s office. Please do not touch, no matter how much you want to.